Photographic Artistry and Graphic Designer, with a knack for crafting wild and whimsical fine artwork images and alluring creative portraits. Born in San Diego, CA., I have worked as an artist for over (32) thirty two years since 1986. For the last twenty two years creating "Photo Artistry" artwork, FX Portraits and Graphic Designs. Between 1986-1996 I created 3D/2D mixed media sculptural wood relief wall artwork, and I operated 3 art studios at the beautiful Spanish Village Art Center, located in Balboa Park in San Diego, CA. With a life long curiosity for the mysteries of science, spirituality, and nature, it has motivated my artistic ways through compelling creative photographic stories. My art is created by using my own digital photo images, along with photo editing and special effects graphics software, including mixed media painting techniques. The phrase "digital technology", might imply to some that the entire process involved in creating my artwork is completely computer generated.... that would be inaccurate. Working through the concept is only one step, I then gather all the imagery that will make it "real" for the viewer and will lead them through the composition. That requires many layers of individual photos that I then mask or composite (remove the background from around a selected object), to blend into an environment that feels like a place you can walk into and explore. 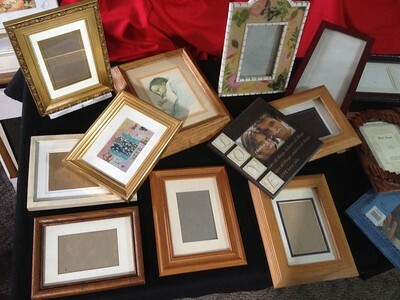 Some art takes less imagery, others, large numbers of photos, digital filters and effects to accomplish. 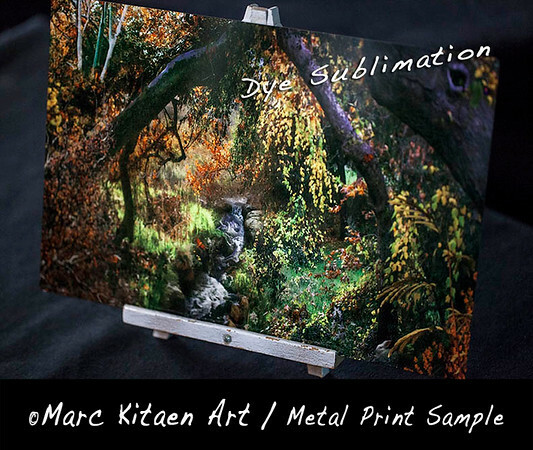 Once completed, I print on gallery-wrapped archival canvas, fine art paper print giclee's, dye sublimation metal prints, acrylic prints, plexiglass and wood, a reproduction process that beautifully supports my vision. All elephants have several distinctive features, the most notable of which is a long trunk or proboscis, used for many purposes, particularly breathing, lifting water and grasping objects. Their incisors grow into tusks, which can serve as weapons and as tools for moving objects and digging. Elephants' large ear flaps help to control their body temperature. Their pillar-like legs can carry their great weight. African elephants have larger ears and concave backs while Asian elephants have smaller ears and convex or level backs. Elephants are herbivorous and can be found in different habitats including savannahs, forests, deserts and marshes. They prefer to stay near water. They are considered to be keystone species due to their impact on their environments. Other animals tend to keep their distance from elephants, while predators such as lions, tigers, hyenas, and wild dogs usually target only young elephants (or "calves"). Females ("cows") tend to live in family groups, which can consist of one female with her calves or several related females with offspring. The groups are led by an individual known as the matriarch, often the oldest cow. Elephants have a fission–fusion society in which multiple family groups come together to socialise. Males ("bulls") leave their family groups when they reach puberty, and may live alone or with other males. Adult bulls mostly interact with family groups when looking for a mate and enter a state of increased testosterone and aggression known as musth, which helps them gain dominance and reproductive success. Calves are the centre of attention in their family groups and rely on their mothers for as long as three years. Elephants can live up to 70 years in the wild. They communicate by touch, sight, smell and sound; elephants use infrasound, and seismic communication over long distances. Elephant intelligence has been compared with that of primates and cetaceans. They appear to have self-awareness and show empathy for dying or dead individuals of their kind. African elephants are listed as vulnerable by the International Union for Conservation of Nature (IUCN), while the Asian elephant is classed as endangered. One of the biggest threats to elephant populations is the ivory trade, as the animals are poached for their ivory tusks. Other threats to wild elephants include habitat destruction and conflicts with local people. Currently I do not offer any chroma key portrait photography. I prefer to photograph people and pets at their homes, on locations at beaches, parks, or my clients can send me their personal images to use in a commission collage or portrait project. A Marc Kitaen Chroma Key Photo Shoot / Video collaboration project at "Green Screen Wizard" studios, with 5 Models and 3 Hair & Make up artists, and the best professional support crew! The pursuit of doing chroma key portraits was a no brainer, since I was already creating a huge artwork backgrounds library, which was ripe and shouting to have subjects placed into them. The constant need for original props, real plants used in my photo digital composites was justification enough to purchasing a (5) five strobe lighting system by "Paul C Buff". My home garage was converted for chroma key photography, and though not large it sufficed for client commissions and my art needs. 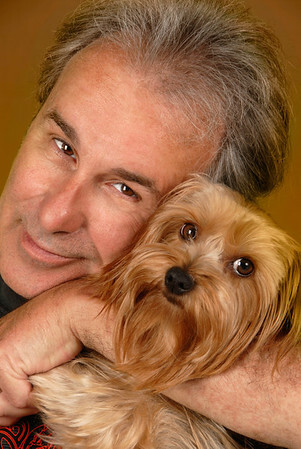 Over the years has been awesome creating hundreds of fun custom art chroma key commissioned portraits for people & pets in studio and locations. Setting up my portable chroma key & lighting at locations took me to events like "Comic Con" after parties and art shows around town. 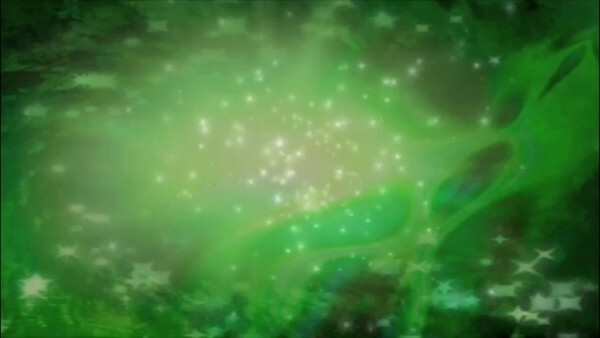 Fate would have me meet a pioneer engineer in the chroma key software industry, "Ken Colby" of "Green Screen Wizard" software. 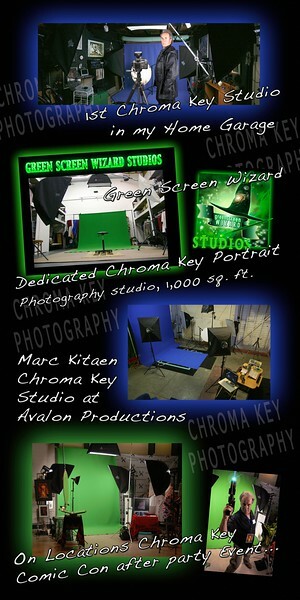 Shortly after meeting Ken, he went and opened up a dedicated chroma key photography business "Green Screen Wizard" studios in San Diego, CA. 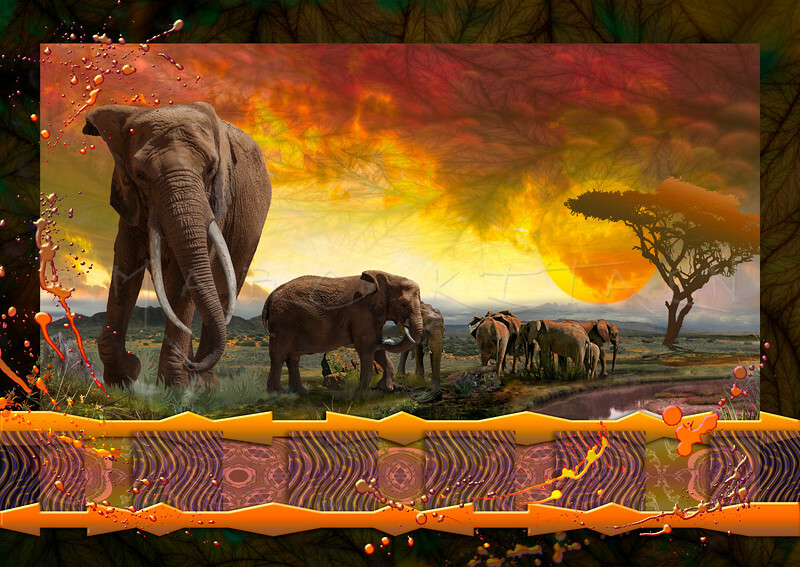 Ken also sells some of my custom art backgrounds CD's on his website at "Green Screen Wizard". 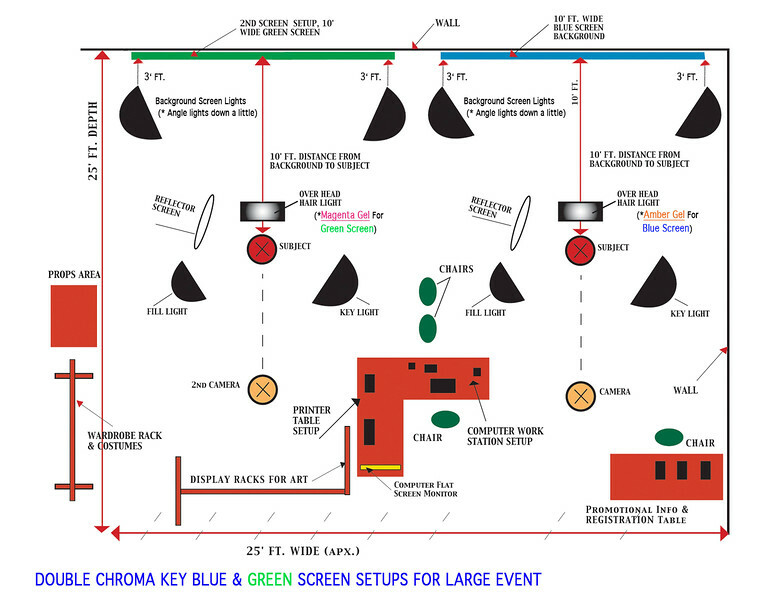 *For advise on Chroma Key topics and setups click here. From 1986 – 1996, at Spanish Village Art Center located in Balboa Park, San Diego, CA , I leased 3 different art studios there. 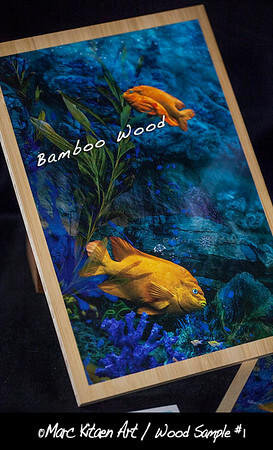 I created 3D/2D mixed media sculptural wood reliefs, large wall decorations and table top designs. The finished art projects had the appearance of being 3 dimensional when viewed from the front and side angles. 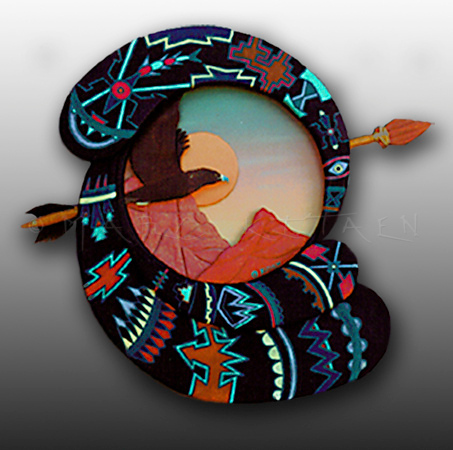 Art themes included: Nature, Wildlife, Native American, Southwest designs and Fantasy. Inlaying wood marquetry techniques, and individual pieces (designs/shapes) were layered on top of each other with the use of plates, held together by screws and glue. I painted each individual piece on all sides and edges, and also sealed them prior to painting and after, ensuring their ability to withstand most environments stresses that they may have to endure. There were also functional design elements built into the creations, like mirrors, shelving and electrically illuminated lighting. Materials and techniques used: Marquetry (inlay and over lay hard wood veneers), oil base stains, sand mixtures, acrylic paints, electrically illuminated, metal work, and other accessories and embellishments. Over 500 art project & designs were completed and sold during that time period, most projects were commissioned by clients. 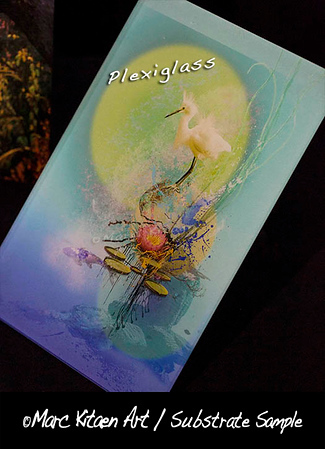 I'm really excited about this new awesome tool, combining science, nature and art! But I am not quite ready to commit to the necessary dedicated time needed going down this artistic rabbit hole just yet. I hope possibly in early to mid 2018 my Microscape artwork will appear on my website. There is an amazing microscopic world hidden inside the ordinary world that we experience daily through our senses. 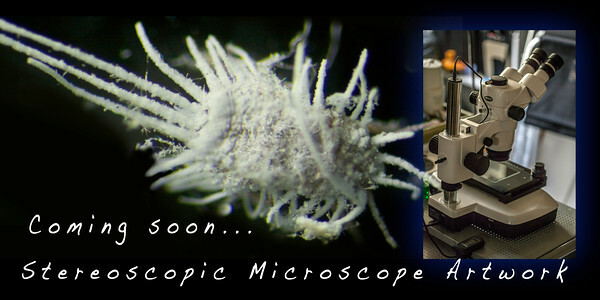 Ordinary objects become extraordinary when seen through the lens of a powerful high magnification microscope. These worlds within worlds are pure inspiration peeled back, revealing the very foundations and structures of primal nature itself. The amazing "Motic" Stereoscopic Microscope, made my jaw drop when I looked at my first objects, which were just grains of sand from the beach. There were lots of crystalized creatures formed millions of years ago! I remember feeling humble and feeling more connected to this planet, then I knew immediately I was hooked and would be making some fun new Microscapes artwork one day. 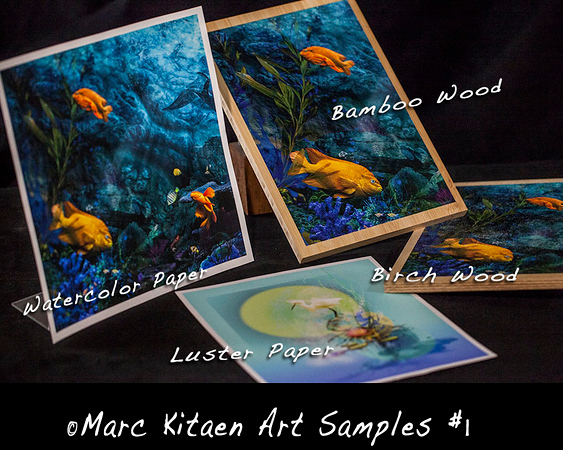 If you want a specific "Size" or "Custom Artwork Image" printed, you can pick from any artwork image from this website. 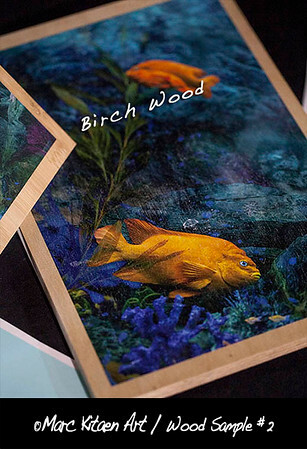 I can offer: Archival Canvas Gallery Wrap Giclee's, Dye-Sublimation Metal Prints, Acrylic, Plexiglas, Multiple Wood Choices and Fine Art Paper Prints. 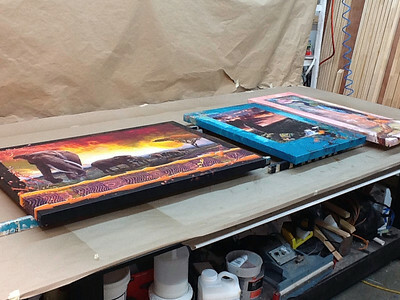 My Custom large print sizes, fine art papers, canvas gallery wrap giclee's, acrylic & plexiglass and wood prints are done through my chosen fine art graphics print house "PIXEL 2 EDITIONS", located here in San Diego, CA. 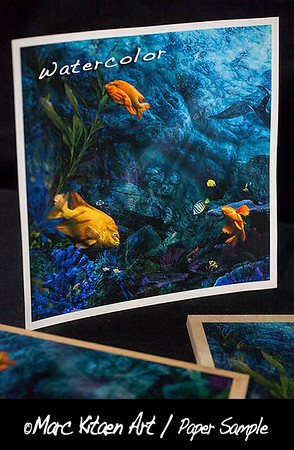 They print my fine artwork images for my art shows and client requests. 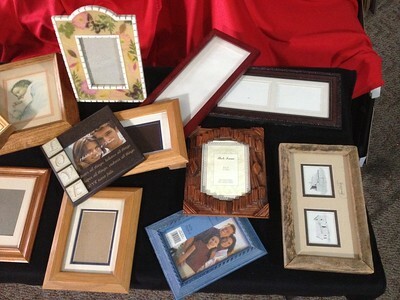 They can ship directly any custom art orders to your home or business location including international destinations. 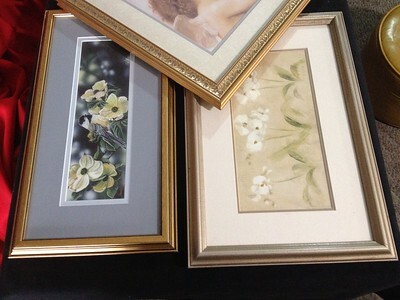 I always have available nice frames in my personal inventory to pick from for your personal artwork requests. 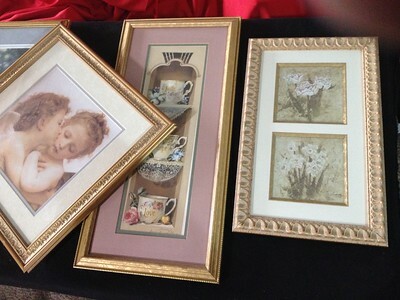 Most of them are small to medium sized frames, including some unique antique frames not shown here.